A set of extensions to Visual Studio 2013 Professional (and above) which improves developer productivity. 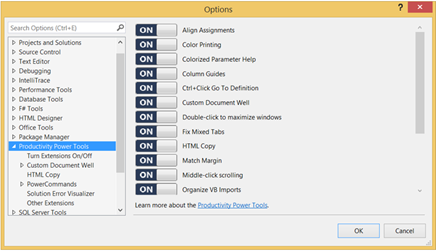 Looking for a version for Visual Studio 2015?Productivity Power Tools 2015. Productivity Power Tools 2013 for Visual Studio 2013 is an extension pack that brings powerful tools for improved developer productivity. In the May update, we fixed a number of customer-reported bugs and issues, and introduced a new feature called syntactic line compression, which enables you to make better use of your screen's vertical real-estate. It shrinks lines that contain neither letters nor numbers by 25% vertically, allowing more lines to be displayed in the editor. Other lines are not affected. We've fixed some of the most reported bugs on Connect including issues related to the Custom Doc Well, loading failures, code switching for XAML, icon updates, structure visualizer and regions support. 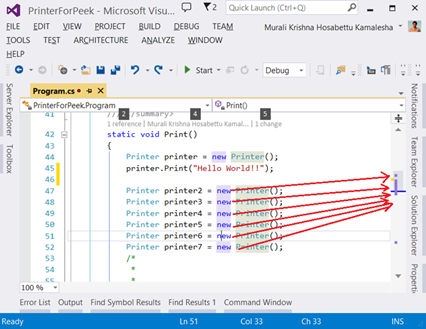 We have introduced a feature called Peek Help which can be invoked from the context menu or using the keyboard shortcutAlt+F1. This brings up the F1 Help content inline in the editor, below the symbol, using Peek. This is a full browser control, so you can do navigation, find and so forth. 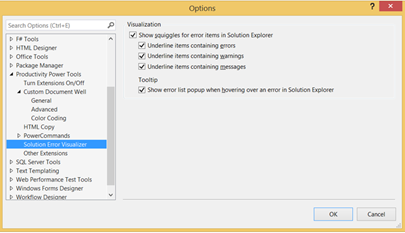 This feature adds error, warning, and message squiggles to Solution Explorer. The information is fetched from the Error List and directly displayed in the Solution Explorer tree view. Hovering over the nodes with squiggles brings up a pop-up with the error/warning/message information. You can filter the Solution Explorer to just files with warnings/errors/messages using filter dropdown in the Solution Explorer toolbar. You can create a new Solution Explorer view, filter it down to Errors and use it as a dedicated Error window. You can turn off categories of squiggles or the popup in Tools > Options Productivity Power Tools > Solution Error Visualizer. The blocks are also marked on the Scrollbar with previews. As usual, you can turn this on/off through Tools Options > Productivity Power Tools > Other extensions > Show code structure in the margin. A quick, easy and temporary way to maximize any docked window by double-clicking its title bar and restoring/docking by double-clicking again. By popular request, we have added the ability to customize the Font family and the Font size used by the PresentOn Quick task. To customize these settings, simply type “PresentEdit” in the Quick Launch search box to open a simple Xml file where you can specify the exact Font family and size. Once you finish your customization, simply Save the file and you are done. Don’t worry about getting something wrong or making an error in this file. Any errors are automatically ignored and a new clean version of the file is created. Ctrl + Click on any symbol to invoke Peek Definition on it. This is the default behavior but if you want Ctrl + Click to Go To Definition, you can get that behavior by unchecking this option in Tools > Options > Productivity Power Tools > Other Extensions > Ctrl Click shows definitions in Peek. We have introduced a new command Edit > Copy Html Markup that puts the raw HTML for the selection into the clipboard in plain text format, so that you can paste it into HTML editors that don’t support WYSIWYG or Paste Special. We added two new options when copying: ReplaceTabsWithSpaces andUnindentToRemoveExtraLeadingWhitespace which detects a common whitespace prefix and trims it so that the copied code is aligned with left margin wherever you paste it. For example, with all lines indented 12 spaces, this option will detect a common whitespace prefix of 12 spaces and trim that. Reopens a closed document, returning the cursor to its last position. Recently closed documents can be reopened through the Edit menu and clicking Undo Close or by using the Ctrl +Shift + Z shortcut. You can view your recently closed documents by going to File > Recently Closed Documents menu. This feature highlights all the textual matches of token at the caret location in the Editor. We have cleaned up the Solution Explorer context menu by moving some of the Power Command items into their own group. You still have all of the Power Commands intact, but we have just moved them into better locations within the Context Menu. Syntactic line compression enables you to make better use of your screen's vertical real-estate. It shrinks lines that contain neither letters nor numbers by 25% vertically, allowing more lines to be displayed in the editor. Other lines are not affected. 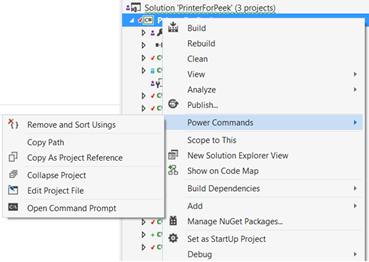 Power Commands is a set of useful extensions for the Visual Studio 2012 adding additional functionality to various areas of the IDE. Individual power commands can be enabled or disabled from the Power Commands page in Tools -> Options in Visual Studio. It can be found under the Productivity Power Tools category. Most Power Commands are enabled by default. 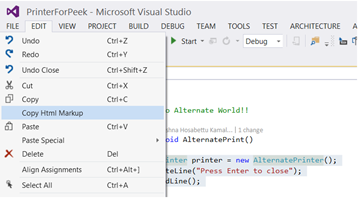 Below is a list of the commands included in Power Commands for Visual Studio 2012. Enables formatting of tabs, spaces and other characters in a document to be saved. It is equivalent to using Format Document command under the Edit->Advanced menu. Disabled by default. Removes unused using statements and sorts the remaining using statements in the C# document being saved. Disabled by default. Adds a button on the toolbar of the Output window that enables the user to clear all output panes at once. Enables the file path of solutions, projects, folders and projects items to be copied from Solution Explorer via right-click menu. Creates an email with the currently selected text. Available via right-click menu in the source code editor. Adds a Guid attribute to the selected class via right-click menu when the current selection is in class scope. Shows the hidden files in all projects displayed in Solution Explorer when the solution node is selected. It enhances the Show All Files button, which would otherwise show the hidden files in the selected project node. Collapses a project or projects in the Solution Explorer starting from the root selected node. This option resides in three different places on the Solution Explorer: Solution, Solution folders and Project nodes respectively. Copies/Pastes a selected class entire content to/from the clipboard. When pasting a class, it is renamed to avoid a compilation error. It can be executed from a single project item or a project item with dependent sub items. Copies/Pastes one or more references to/from the clipboard. It can be executed from the references node, a single reference node or set of reference nodes. Copies a project as a project reference to the clipboard. It can be executed from a project node. Opens the MSBuild project file for a selected project inside Visual Studio. It combines the existing Unload Project and Edit Project commands. Opens a Windows Explorer window pointing to the physical path of a selected item. It can be executed from a project item node. Opens a Visual Studio command prompt pointing to the physical path of a selected item. It can be executed from four different places: solution, project, folder and project item nodes respectively. Unloads all projects in a solution. This can be useful in MSBuild scenarios when multiple projects are being edited. This command can be executed from the solution node. Reloads all unloaded projects in a solution. It can be executed from the solution node. Removes and sort using statements for all classes given a project. It is useful, for example, in removing or organizing the using statements generated by a wizard. This command can be executed from a solution node or a single project node. Creates a constant definition statement for a selected text. Extracting a constant effectively names a literal value, which can improve readability. This command can be executed from the code editor by right-clicking selected text. Clears the Visual Studio recent file list. The Clear Recent File List command brings up a Clear File dialog which allows any or all recent files to be selected. Clears the Visual Studio recent project list. The Clear Recent Project List command brings up a Clear File dialog which allows any or all recent projects to be selected. Executes a custom tool with associated text templates items. It can be executed from a DSL project node or a DSL folder node. Closes all documents. It can be executed from a document tab. Adds support for printing code in color. There is no option to hide collapsed regions. Collapsed regions are always printed as though they were expanded. 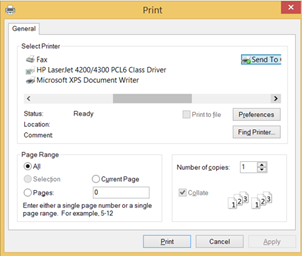 There is no explicit option in the print dialog to print line numbers. Line numbers will be printed if and only if the line number margin is turned on via Tools->Options. The margins for the printed page (top/bottom/left/right margins) are not customizable. Printing in high contrast black modes may require users to manually update the background color for Plain Text in Tools->Options->Environment->Fonts and Colors->Printer. This is because the VS color settings for printers will use the black background color from the high contrast theme. Enables you can press down on your scroll wheel and the move the mouse to quickly scroll through your document! 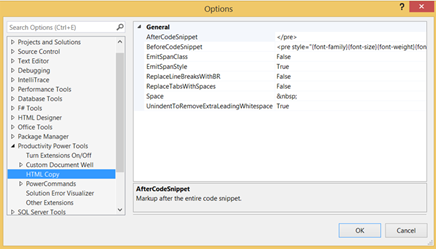 Enables Visual Basic developers to sort Import statements logically as well as remove the ones unused ones. This extension allows users to change the behavior of their document tabs. Users can customize the behavior and look of the tabs via the Tools > Options dialog. Show the close document button in the document well that will close the active tab, similar to Visual Studio 2008. Using Ctrl+Alt+Page Down and Page Up to navigate between tabs (including pinned) in visual order. As much as we try, some experiences in the Productivity Power Tools are not for everyone. If you want to shut off an extension, go to Tools | Options | Productivity Power Tools and find the extension on the right (remember to scroll!). By toggling the slider to Off and restarting Visual Studio, that extension will no longer be loaded and you will revert to the default Visual Studio behavior. Provides support for the HTML Clipboard format when cutting for copying code from the editor. This means there is no need to fix up the formatting of code when pasting it into a TFS work item form or another HTML based control. It is possible to modify the html format which gets copied to the clipboard. Users can customize the behavior in Tools > Options > Productivity Power Tools > HTML Copy. Warns users when a file opened or saved that contains a mixture of tabs & spaces. Adds an information bar to provide an easy way to fix the file if desired. This feature has been replaced by Ctrl + Click Peek Definition, But you can still get the Go To Definition behavior by customizing Ctrl + Click through Tools > Options. This feature enables clickable hyperlinks to symbols in source code in your code by holding down the Ctrl key when hovering with the mouse. Note! This may conflict with your formatting settings. E.g. in C# you will need to disable: Tools->Options->Text Editor->C#->Formatting->Spacing->"Ignore spaces in declaration statements"
Adds syntax highlighting to the contents of the Parameter Help window for C#& VB. Syntax highlighting colors can be customized using the display items prefixed with “Signature Help” in the “Fonts and Colors” menu.